The Howard Miller Penrod 625-581 Large Wall Clock is an impressive oversize wall clock. This rectangular wall clock is finished in a weathered, Driftwood finish inspired by the natural yet rustic nature of reclaimed woods. The black dial features contrasting polished chrome finished Roman numerals and hands and is easy to read at a distance. Quartz battery-operated movement requires one AA battery. 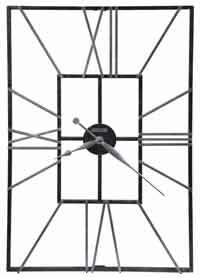 Height 34.5", Width 26.5", Depth 2.75"
Clocks for sale at The Clock Depot including the 625-581 at discount prices.